The Premiership leaders will have to wait at least two weeks to clinch their eighth consecutive title after being denied by a string of first-half saves from Liam Kelly. The tempo and number of chances dropped after the interval, but substitute Oliver Burke missed a glorious stoppage-time opportunity after Kelly failed to hold Odsonne Edouard's strike. 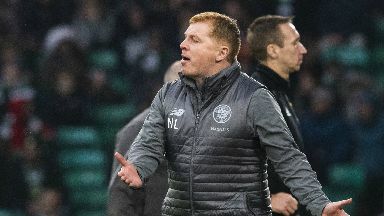 Lennon, whose side are 14 points clear of Rangers with five games left, said: "It's frustrating because we created great chances, even in the 93rd minute we had a great chance to win it. "The performance was decent, the first half very good, the second half a little bit huffy and puffy. We put a bit of width in the team and again we created some really good chances. "I just think we overplay it, at times we can get the ball forward a little bit quicker. "We could be a little bit more direct and get the ball in earlier and our set-play delivery needs to be better as well because we had plenty of corners and free-kicks in good areas and didn't hit the area we wanted to attack. "They are good defensively and I knew that before the game. I knew they would be a big, strong physical team and throw their bodies on the line and come and head the ball, and the goalkeeper excelled. And you get that some days. "Is it poor finishing from our point of view or excellent goalkeeping? Probably a little bit of both." Livingston earned their first point at Celtic Park in the club's history to follow up their achievement of securing their Premiership status. Manager Gary Holt said: "You come to these places and you're going to need most of your players playing at their top level and your goalkeeper having an outstanding game. Thankfully that happened. "He made some, probably routine saves for Liam, to be honest. He's not happy with the one at the end, but over 90-odd minutes I will take one that gets away from him. He was excellent and he deserves his clean sheet, like the rest of the boys. "We spoke about not being nervous and apprehensive. Celtic will have the ball, the stats back that up. So we said stay within the structure and don't suddenly think you need to chase the ball. "They don't realise how much of an achievement it is to stay in this league as a side promoted through the play-offs. I told them to come and embrace it and run about like wee boys. "It's another feather in the cap. We have taken points off every team in the league." Meanwhile, Lennon still retains hope that injured defender Dedryck Boyata will sign a new contract, despite reports in Germany claiming the Belgian had agreed a deal with Hertha Berlin. "I'm not aware of that, Dedryck was at the game," Lennon said. "I wouldn't be surprised if there is interest in him, but we are still hopeful that we can persuade him to stay, which would be great for everyone."